All Web addresses mentioned were functional as of 11-18-16. From the Cumberland Gap to the Atlantic Ocean, this is Virginia Water Radio for the week of November 21, 2016. This week, we re-do an episode from November 2012 featuring a Thanksgiving-sound mystery. Have a listen for about 15 seconds, and see if you know what this familiar call has to do with water. You’ve been listening to a Wild Turkey call, and if you guessed that a full-grown domestic turkey may drink 1 to 2 gallons of water per week, you’re a poultry expert! But we’ve used the call of this non-aquatic bird to make the point that all birds need water. In fact, birds are largely water; studies have measured birds’ body mass at 60 to 70 percent water. Birds get water from obvious sources like ponds and streams but also from less obvious places, such as dew and the water contained in birds’ food. In addition, birds conserve water in several ways. First, like mammals, birds use their skin covering, behavior, and internal anatomy to reduce the water used to maintain a constant body temperature. Second, like reptiles, birds excrete nitrogen waste in uric acid, a substance that requires little water. And third, again like most reptiles, birds use a shell to maintain a watery environment for eggs laid on land or other relatively dry surfaces. While the role of water is obvious for ducks, shorebirds, and other aquatic bird species, managing this fundamental substance is essential for all of our feathered friends. Thanks to Lang Elliott for permission to use this week’s sounds, from the Stokes Field Guide to Bird Songs. And we close with some original music inspired by Wild Turkeys, “Turkey Tune,” composed for Virginia Water Radio by Torrin Hallett, a student at Oberlin College and Conservatory in Ohio. Happy Thanksgiving! This episode is a slightly revised repeat of Episode 137 (11-19-12), which has been archived. The sounds of the Wild Turkey were taken from the Stokes Field Guide to Bird Songs-Eastern Region CD set, by Lang Elliott with Donald and Lillian Stokes (Time Warner Audio Books, copyright 1997), used with permission of Lang Elliott, whose work is available online at the “Music of Nature” Web site, http://www.musicofnature.org/. Thanks to Dr. Dean Stauffer of the Virginia Tech College of Natural Resources and Environment for his help with this episode. “Turkey Tune” is copyright 2016 by Torrin Hallett, used with permission. In 2016-17, Torrin is a fourth-year student at Oberlin College and Conservatory in Oberlin, Ohio, majoring in horn performance, music composition, and math major. More information about Torrin is available at his Web site, http://www.torrinjhallett.com/. Thanks very much to Torrin for composing the piece especially for Virginia Water Radio. 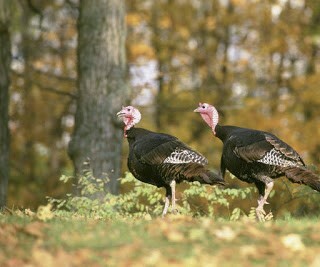 Male Wild Turkeys in Ohio during fall in 2001. Photo by Steve Maslowski, made available for public use the U.S. Fish and Wildlife Service's National Digital Library, online at http://digitalmedia.fws.gov, accessed 11-21-16. 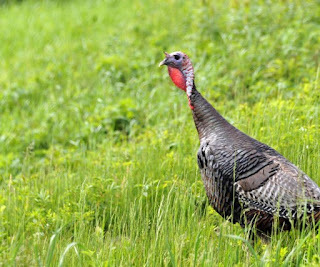 Wild Turkey at Parker River National Wildlife Refuge in Massachusetts, May 31, 2011. Photo by Matt Poole, made available for public use the U.S. Fish and Wildlife Service's National Digital Library, online at http://digitalmedia.fws.gov, accessed 11-21-16. H. I. Ellis and J. R. Jehl, Jr., “Total Body Water and Body Composition in Phalaropes and Other Birds,” Physiological Zoology, Vol. 64, No. 4 (1991), pages 973-984. Richard W. Hill, Comparative Physiology of Animals: An Environmental Approach, Harper and Row, New York, N.Y., 1976. National Research Council, Nutritional Requirements of Poultry: 9th Ed., National Academies Press, Washington, D.C., 1994, page 16; available online at https://www.nap.edu/catalog/2114/nutrient-requirements-of-poultry-ninth-revised-edition-1994. (Table 1.1, “Water Consumption by Turkeys and Chickens,” notes that a “large white turkey female” at 20 weeks consumes an estimated 7040 ml water per week, or about 1.9 gallons [1 gallon = 3.785 liters]; this can vary considerably due to temperature, salt intake, etc.). Virginia Department of Game and Inland Fisheries’ (VDGIF) “Wild Turkey Information” Web page http://www.dgif.virginia.gov/wildlife/turkey/, and the VDGIF’s “Fish and Wildlife Information Service” Web page at http://vafwis.org/fwis/?Title=VaFWIS+Species+Information+By+Name&vUT=Visitor. Joel Carl Welty, The Life of Birds, 2nd Ed., W. B. Saunders, Philadelphia, Penn., 1975. All Water Radio episodes are listed by category at the Index link above (http://www.virginiawaterradio.org/p/index.html). Please see specifically the “Birds” subject category.